I call this The Twilight Zone. 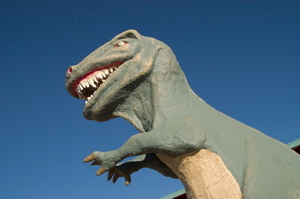 Photographed in 2004, somewhere east of Brawley, California, along Route 66. I don't ordinarily care for selectively coloring (or decoloring) photographs, but I thought it told a story here. My second CD cover has just come out. The Road Crew, a rockabilly band out of Nashville, has used one of my Route 66 photos on the back cover of their latest CD, Rock-A-Billy Road. The cd contains 15 tracks of traditional rockabilly-style tunes, by Elvis Presley, Buddy Holly and others. It would make an ideal cd for a 50s party or to provide the soundtrack for your next road trip! Check out the sunset behind the band's portrait. Does it look familiar? The magic of Photoshop! The tunes are available at cdbaby.com, or at any live appearance by the band. Today I had the pleasure of presenting my slide show: Colors of the Past, Photographs Along Route 66, to the Hillcrest/Mission Valley Lions Club in San Diego, California. It never ceases to amaze me how enthusiastic groups are to hear about Route 66. Many audience members traveled to California on Route 66, or, as children, spent vacations on Route 66. Today I sold a 24x36 inch canvas print of this photograph, taken near Chambless, California, on Route 66, to a collector in San Diego. Last week, a gentleman asked permission to use this image to open a slide show being shown at the 2011 Route 66 convention in Amarillo, Texas. If you have any use for stock or fine art photography of almost any subject on Route 66, it is likely that I can find the right image. Feel free to contact me. I just sold a 16x24 inch canvas print of this photo from Yucca, Arizona, along Route 66. (shot with a Lensbaby, grain and noise added in Photoshop). Just about all of the images you see in this blog, on my website, or on my pbase photosharing site are available as signed canvas prints. They look great on the wall, make great gifts, and come in all sizes, up to 24x36 or larger. Most images are available for stock or editorial use as well. I will be giving my Route 66 slide show for the Friends of Lake Murray, this Thursday, November 20, at 5:00 p.m. The show is open to the public, and the meeting takes place at St. Dunstans Church, at 6556 Park Ridge Blvd, La Mesa, CA. If there's time I will show some bird and flower photos, too. If you've been wanting to try out a Lensbaby, here's your chance! This Saturday, October 4, the Julia Dean Photo Workshops is holding a half-day workshop at Venice Beach (California) where you can demo any of the old and (I think) the new Lensbabies. Leading the workshop is my friend Lisa Smith, who is one of the most creative and inspired photographers you will ever meet! If you'd like to add a Lensbaby to your photographic arsenal, and improve your photographic vision, this is the workshop for you! Lensbaby just introduced a new lens, called Composer, which I am eager to try. 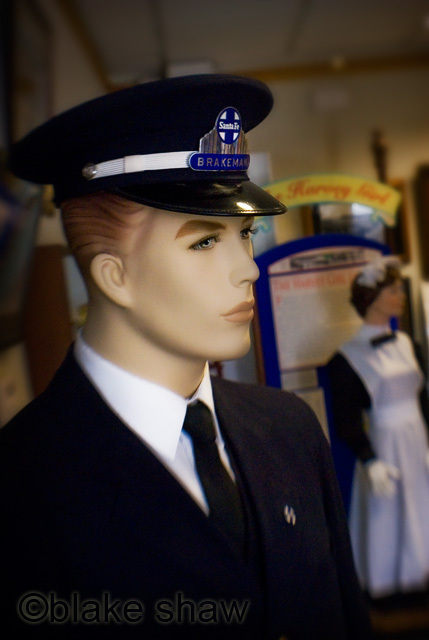 Here's a Lensbaby shot taken at the Western America Railroad Museum in Barstow, California. You may notice I didn't start with A in my posts, even though this is PhotoABCs. That's because I really like to emphasize the importance of background. I like to think of background as being clean, contextual, or cluttered. Of course, clean is usually good, as I showed in yesterday's post. What is often more difficult, is giving the subject a contextual background, in other words, showing it in its environment, without being cluttered, or distracting. Remember, most often, a simple photograph is more direct and communicates better than a busy one, with too many distractions. Here is a sequence of photos I took at Grand Canyon Caverns in Arizona, along Route 66. 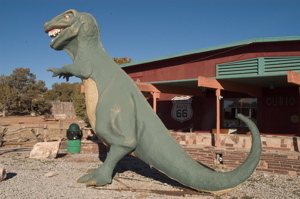 The first photo shows the dinosaur in its location, in front of the caverns entrance. 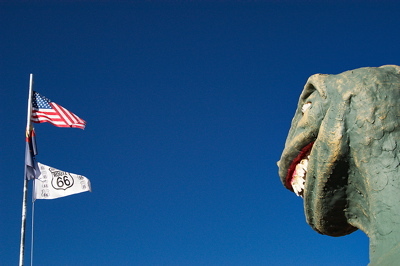 The blowing US and Route 66 flags are just enough to give a context for the dinosaur. Having the dinosaur on one edge, and the flags on the other, gives visual interest. (E is for Edges will be a later topic).